I usually water down burnt sienna for my first few strokes. I make a few tick marks to remind myself where to leave margins, then I paint and wipe off, paint and wipe off, to roughly block in where the head will go. Next I look for shapes of color, usually starting with lights first, then darks. I find I’m more successful painting shapes than painting lines. This has been a nice surprise, that painting is easier for me than drawing! Who would have guessed? Perhaps due to my background in sculpture, I begin at this early stage to establish volumes, and their interrelationships. Once the basic geometry of the face is established with shapes and masses, I dot in some landmarks such as the pupils, nose shadow, and lip line, trying to get them in some semblance of proportion with each other and with the overall head shape. I try to consciously keep things fluid, *always* being willing to paint over something I just painted a few minutes earlier…continuing to roam the features of the face almost as if feeling it rather than painting it…getting familiar with it by repetition of observation…discovering ever more subtle features and anomalies as I go. In a way, I’m doing one long series of preliminary sketches on top of one another, refining and revising. (This is the most daunting stage, when doubts rush in and make it difficult to focus.) I try to continually circle back to relating to the whole rather than to the particular…for example, I may use the top of the nose just between the eyes as a reference point over and over, mentally mapping and remapping the features in relation to that one spot rather than to each other (yet). Simultaneously/alternatingly I am trying to be conscious of the features’ relationship to the whole face/head shape, and occasionally zooming my awareness back out to the bigger picture, changing the whole tilt of the head, perhaps, or the sweep of a jawline, or giving more real estate to the forehead…which of course necessitates starting all over with re-establishing placement of features. But the more times this cycle repeats, the easier it is to re-do because I’m gaining familiarity with the model’s facial terrain. And so I proceed, ever circling, roaming like a Roomba, zooming in close then back out wide, until I am rewarded with a likeness emerging from my layers of prior accumulated guesses. This “recognition moment” is a positive turning point in the process, for now I can begin referring future brushstrokes to *specific* landmarks, revising proportions ever more precisely. Along about this same time, I get the reward of personality, expression, personhood emerging. 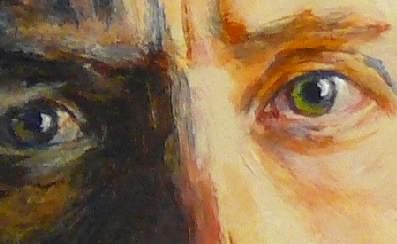 There will still be several paintovers to endure (where I paint a perfect pair of lips, but they’re 1/16″ too low in relation to the eyes, so I repaint them), but at least the doubts begin to recede, and expectancy and excitement take their place. It’s a huge relief to finally see a general likeness emerge, but this too is just a step along the path with much more yet to come. Now I can turn attention from geometry to color, light, gesture, expression, mood…it’s hard to break this down into words, because so much is unconscious as I do it — I kind of go on autopilot considering many things simultaneously, surfacing once in awhile to step back and assess my progress. From here on the process becomes more straightforward. Add more shadow here, warm up the skin tone there, soften an edge to drop it back, and so on, my eye and hand following each other around the painting dealing with whatever stands out as most in need of improving…ever smaller and smaller changes…until a sense of accomplishment starts to manifest as I realize I’ve finished! Which is almost always false…for almost always when I think I’m “finished” I still continue to “fix” things for a few more days. When I can look at the portrait and enjoy it rather than my eye being drawn to something else to fix, I sign it.